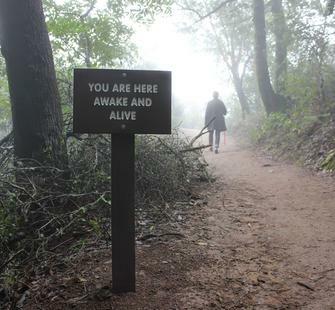 Examining the power of natural places to elevate and enrich human experience and health, Susan O’Malley’s A Healing Walk guides visitors through Montalvo’s forest trails with text-based signage reminding us to practice mindfulness and appreciate the healing effects of the countryside. Supported by Lucas Artists Program at Montalvo Arts Center, A Healing Walk was originally installed in 2012 as part of the exhibition Happiness is…. The work is now part of Montalvo’s permanent collection of Art on the Grounds. It was reinstalled in 2018 in collaboration with Santa Clara County Parks and Recreation.